H.P. Lovecraft’s Supernatural Horror in Literature, first published in 1927, is widely recognized as the finest historical survey of horror literature ever written. The product of both a keen critical analyst and a working practitioner in the field, the essay affords unique insights into the nature, development, and history of the weird tale. 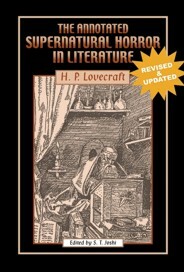 Beginning with instances of weirdness in ancient literature, Lovecraft proceeds to discuss horror writing in the Renaissance, the first Gothic novels of the late 18th century, the revolutionary importance of Edgar Allan Poe, the work of such leading figures as Nathaniel Hawthorne, Ambrose Bierce, and William Hope Hodgson, and the four “modern masters”—Arthur Machen, Lord Dunsany, Algernon Blackwood, and M.R. James. In this annotated edition of Lovecraft’s seminal work, acclaimed Lovecraft scholar S.T. Joshi has supplied detailed commentary on many points. In addition, Joshi has supplied a comprehensive bibliography of all the authors and works discussed in the essay, with references to modern editions and critical studies. For this new edition, Joshi has exhaustively revised and updated the bibliography and also revamped the notes to bring the book in line with the most up-to-date scholarship on Lovecraft and weird fiction. The entire volume has also been redesigned for ease of reading and reference. This latest edition will be invaluable both to devotees of Lovecraft and to enthusiasts of the weird tale. The Annotated Supernatural Horror in Literature, By H.P. Lovecraft, Edited, with Introduction and Commentary, by S.T. Joshi. New York, NY: Hippocampus Press; first edition (2000, ISBN 0-9673215-0-6, 172 pages), second edition (2012, ISBN 978-1-61498-028-5, 228 pages); Softcover. This book may be purchased in softcover (first edition) from Amazon.com or Barnes & Noble, in softcover (second edition) from Amazon.com or Barnes & Noble, or directly from the publisher, Hippocampus Press.